Opening a restaurant is always a challenge, and a Cleveland fine-dining establishment called EDWINS decided to make it extra difficult. The proprietor, Brandon Chrostowski, aimed to open the greatest French restaurant in the United States, while managing a staff composed almost exclusively of untrained cooks transitioning out of prison. 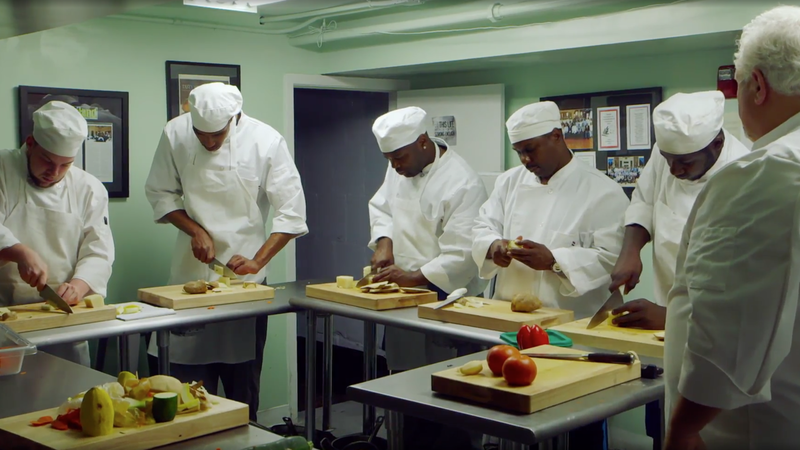 Thomas Lennon's clear-eyed, soulful Oscar-nominated documentary short Knife Skills follows the EDWINS staff beginning six weeks prior to opening night; the former inmates' trial-by-fire demonstrates the difficulties of reintegration and the pressures of a second chance. Documentary reached director Thomas Lennon by phone from his home in New York. How did you find this story? It's a pretty remarkable and unusual one. Sometimes you just get lucky. I have a good friend named David Waltuck, who's a really top chef in New York. His wife happens to have been childhood friends with my wife. I went to dinner with them, and I thought it was just going to be the four of us. Then there was this other guy there, and he was pretty odd, I have to say. At first, I just couldn't get a read on him at all, and then he was quite shy and very soft-spoken. Then he declared that he was about to open the greatest French restaurant in the United States. His statement didn't quite fit with the personality that I had encountered so far. I asked him more about it, and then once he told me that it was going to be staffed almost entirely by people just out of prison, I knew immediately that there was a potential film there. I would love to say that it grew out of my long passion for criminal justice issues or my deep knowledge of food, neither of which is true. I am just a documentary filmmaker—and, I guess, an opportunist. I could just feel that there was an opportunity there to tell a story. I didn't know what story it would be, but I figured that one way or the other, there would be a story there. The great good luck of that encounter was that it happened before he had opened the restaurant, and he was just about to sign the lease when he talked to me. The other piece of good fortune is that a couple of months before, I had just bought my new camera, a Canon C300, and so I was just ready. I didn't make a commitment to making the film, and he didn't make a commitment to me for a while. I just explored and worked to get his trust and worked to figure out whether there was a film there. Pretty quickly, I would say that within a few weeks, I was pretty confident this was a film I should make. But even from that initial promising premise, there are a lot of different perspectives your film could've taken. At the beginning we're presented with a lot of information, including that quote about opening the best French restaurant in America, but the film doesn't really give us a sense of the inception of the idea behind the restaurant. Did Brandon have trouble convincing people this was a good idea? I found out much later that this was something he'd been wanting to do for 10 years. As the film later reveals, he'd had his own brushes with the law and then had had a kind of multifaceted conversion, part of which was I think a spiritual, religious conversion, which I don't really treat in the film. He keeps that pretty private, and he doesn't bring that into the restaurant at all. This was something he decided he wanted to do a long time ago, but he's a very systematic and long-term thinker, and so he built up his own credibility in the restaurant business, and actually has quite a significant restaurant résumé. Again, that's not in the film, and we can talk about why it's not in the film. He had been very methodically building up his cred to the point where he'd be able to do that, and that included researching which cities had really significant recidivism issues, dropout rates, urban blight, so on and so forth. He picked Cleveland quite consciously with that goal in mind. None of this did I know. So he's not a Cleveland native? No. He's Detroit-born and had a very rough-and-tumble childhood, by the sound of things, and then entered this world of really, really fancy dining: Charlie Trotter in Chicago; David Waltuck in New York; a three-star restaurant in Paris where he did not speak a word of French, I believe, but somehow managed to navigate his way. There was a pretty fancy résumé behind him by the time he came to Cleveland, and by the time he came to Cleveland, he knew what he wanted to do. Why did you choose to keep so much information off-screen? Not just about Brandon. I learned online that EDWINS now has housing and a thrift store for its employees. Right. Let me give a practical answer to that and then a philosophical answer to that. The practical answer to that was my goal was to provide a snapshot of a moment in time, and that moment was the first six months of the restaurant leading up to the graduation of the first class. It took me a long time to finish the film because I had to raise money, and there were all sorts of obstacles. During that time, the project expanded. His project expanded, rather. He set up residential housing. Then he even had this run for mayor where he dove into Cleveland politics, but none of that was part of my window of the thing that I had really filmed and captured, so I wanted to keep within that sphere. That's the practical decision. Then there is also this: we live in an era where if I can succeed in making you interested about a group of people and make you care about those people, you can then instantly finish the film, go online, and within 10 or 15 minutes you have the answers to all sorts of ancillary questions that you may want answers to, like, How does the restaurant work? Does the food pay for all of the instruction, or is it partly nonprofit? The answer is, it's actually a nonprofit entity. There are all kinds of things you can find out, but I just wanted to give you a human immersion into a group of people and this kind of improbable family that they created for themselves while they were trying to dig themselves out of trouble. That was my goal. Right. The risk you run, though, especially if your film is non-theatrical, is that people will be doing that Googling while watching the film. I will tell you that I wasn't, but it's always a possibility. It always is, but that's a possibility anyhow. It's a possibility also that they'll be out there texting their spouse to find out if they want to bring milk home on the way. It drives me nuts, but you see, that argument actually goes both ways. We're living also in a time of infinite distraction, so you have got to keep the viewer locked in to the dramatic and human story that you're giving them and not allow yourself to be pulled off track even for a microsecond, because the person just jumps off. At the end of the film, it's mentioned that the restaurant has been successful, but in the viewer's mind it’s still an open question of whether this was a worthy experiment or the greatest French restaurant in America. What has the reaction been from both food critics and local restaurant-goers? Is there a sense that this project could be replicated elsewhere? Cleveland has really rallied around this restaurant, and I think that's partly because it's a worthy idea, partly because it's such an unlikely idea, but also because the food is damn good. I was so determined to keep my journalistic distance from the film that I never accepted any of the food for free when it was available to me. I would go across the street to the diner and eat because I didn't want to be indebted, and I also was kind of cheap, and I didn't want to pay for it all myself. I didn't have much money. Then when I started eating it, I realized the food is really good. I had a difficult relationship with Brandon while the film was getting made because he didn't really know what I was going to do. He wasn't sure whether I was really going to do right by him and so forth, but once he saw the film, he got very excited about it because he thought it had the potential of spreading the message about reentry more widely. That doesn't quite answer your question, which is, How replicatable is it? Brandon is a character and a very hard-driving and eccentric guy, and I don't think you can just parachute anybody into that situation and make that work. I think it's very much a reflection of his own obsessions and his own ghosts, but he certainly wants to see... But I think variations of that are going to work and, in fact, are working. One of the things we're finding is that it took me so damn long to make the film that now there are several of these projects around the United States that are not identical. They generally don't tend to be so fancy, but there are catering companies and bakeries. A lot of that existed before Brandon as well, and so there's now a kind of chorus of restaurants saying, "Yeah, we're doing something like this." That's great to see. Knife Skills screens at IDA's DocuDay on March 3 at 8:00 p.m. at the WGA Theater in Beverly Hills. Akiva Gottlieb is IDA's communications manager, and associate editor of Documentary magazine.